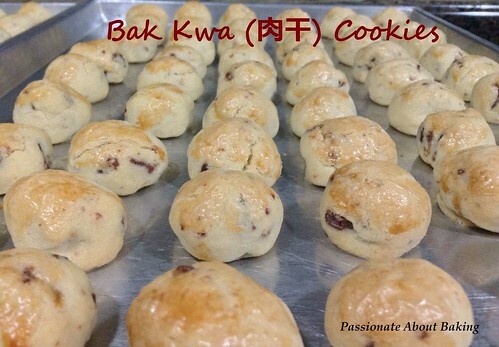 I'm reposting this Bak Kwa Cookies using Liv butter. Add the egg and beat till well incorporated. Add the flour and bak kwa, and mix thoroughly. Use a scrapper to cut out into small sizes, and shape it accordingly. Placed it on a baking tray, spacing out evenly. Egg wash the top to get some golden colour. Bake at 180C for 16-18mins, or until it turned golden. Last year when I made this, I rested the dough in the fridge for at least 30mins. This time, I rolled it immediately after mixing. I realised that by resting the dough in the fridge, it produced a more refined crispy taste. After mixing the dough, it's still very soft. However, it is still manageable to roll them up. After baking, the cookies were crunchy. However, after a day, it turned slightly softer. It didn't taste like those "soften (lau hong)" kind though. You may hop over to Anncoo & DreamersLoft's blog to view their cookies too! It's always a challenge to bake birthday cake for my elder sister. She likes chocolate and hazelnuts. She likes flourless cakes. Put them together and you'll get Chocolate Flourless Cake? Yes, done that and that. I had to hunt high and low to try to find a suitable recipe. In the end, it was a combination of recipes that I put together. I'm glad the cake turns out well and she appreciated it and loved it! 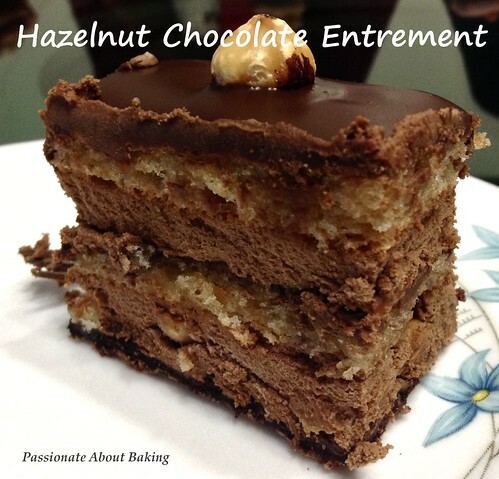 Sift the icing sugar and mix together with the ground hazelnuts. Whisk the egg whites with the sugar until stiff. 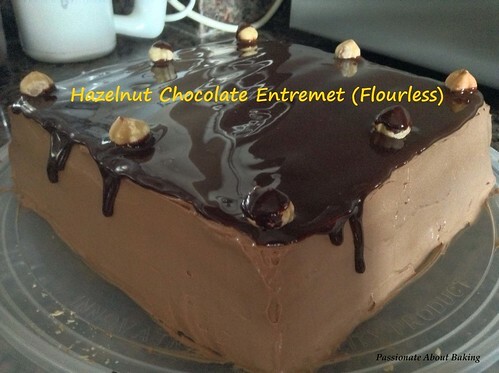 Fold the hazelnut mixture gently into the meringue. Pour into the two prepared pans equally. Bake for 15mins in a preheat oven of 180C. Remove from the pan and let it cool completely. Chocolate Meringue, adapted from Cadbury. Beat the egg whites until stiff peaks form. Continue beating, adding the sugar a little at a time until dissolved. Sprinkle sifted cocoa powder and vinegar and gently fold in. Bake at 150C for 45mins. Turn off the oven heat and leave the door ajar to cool the meringue. Heat the first 150g whipping cream. Pour it into a large mixing bowl with the dark chocolates. Stir until completely mixed and smooth. Scoop up three big cooking spoon of the ganache. Put aside. Whipped up the remaining 200g of cream till soft peak. Fold in the bigger portion of the ganache into the whipped cream. Mix well. Set aside. Place the chocolate meringue as the base. Topped with chocolate mousse evenly. 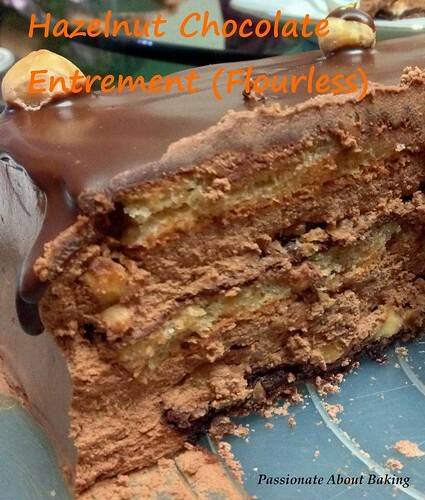 Place a layer of hazelnut dacquoise on top of the mousse. 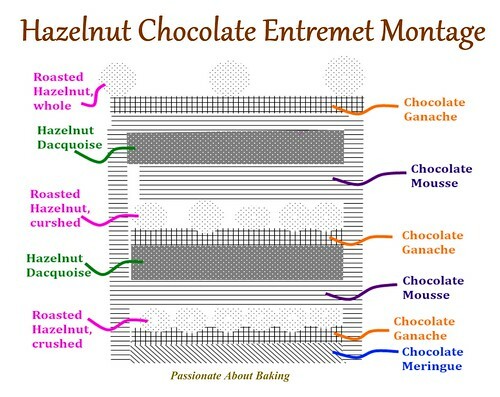 Place another layer of hazelnut dacquoise on top. Frost all the sides with chocolate mousse, and the remaining on top of the dacquoise. Chill the cake for at least an hour to harden the chocolate mousse. 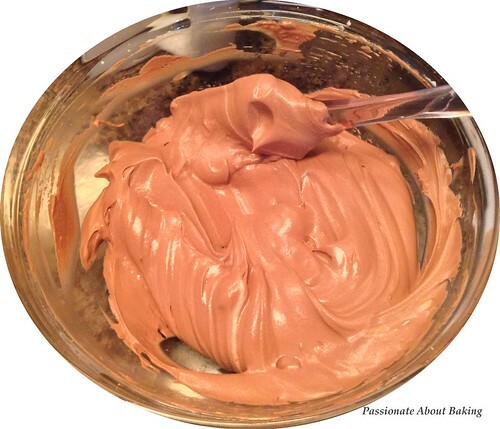 With the remaining chocolate ganache, spread it evenly on top of the chocolate mousse. 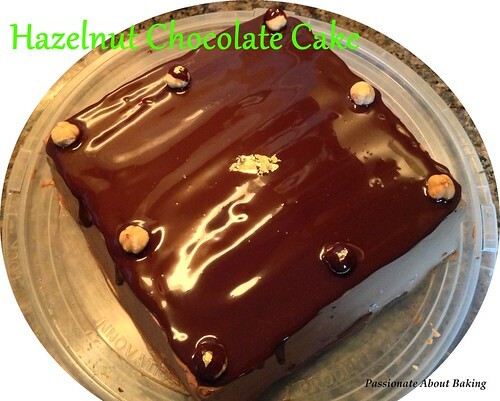 If the chocolate ganache has harden, heat in the microwave for 20 secs, or over a pot of boilling water. 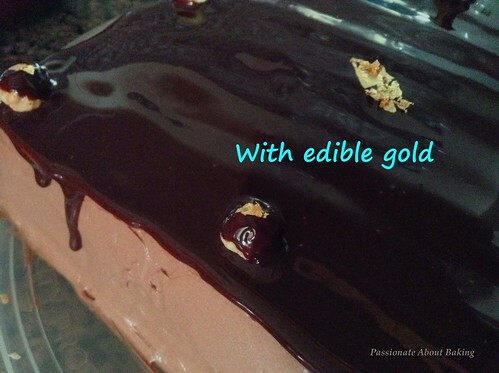 Decorate with remaining whole hazelnuts and edible gold, or whichever way you like. 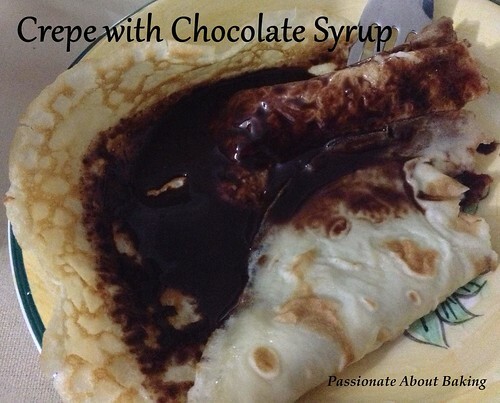 One of the simplest dessert to make is crepes. You can add any toppings to your liking-fruits, syrup, or even ice creams to eat with. Enjoy. Recipe for Crepes, adapted from Gordon Ramsay's Desserts. Place the flour and salt in a food processor and add the eggs, butter and half of the milk. 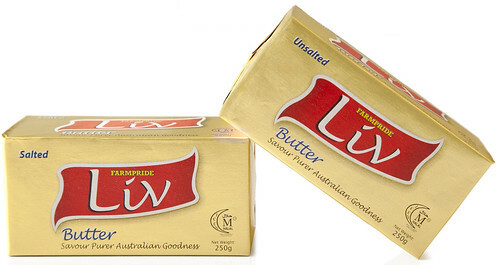 Whiz until smooth and creamy, scraping down the sides once or twice to dislodge any lumps or stray pockets of flour. Leave the batter to rest for 30 mins if you like, although this is no longer deemed to be necessary as flours are now so thoroughly refined. Pour the batter into a jug and have a small ladle ready. Most crepes are best made with about 2-3 tablespoon of batter. Pour a small amount of vegetable oil into a cup. Start to heat the empty crepe pan until you can feel a good heat rising. Add a few drops of oil, tilt to grease the base of the pan, then tip out any excess. Pour in about 2-3 tablespoons of batter from the ladle. Immediately swirl the pan so the batter coats the entire base thinly. Quickly put the pan back on the heat and cook until the batter is set and little holes appear in the surface, about 1.5 minutes. 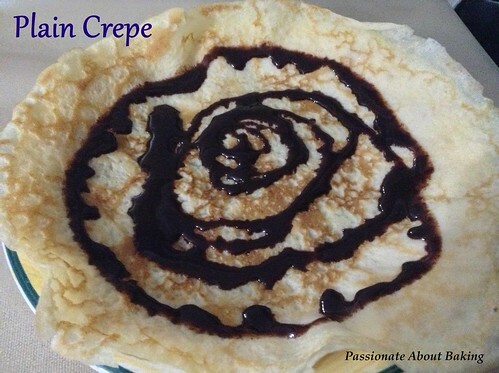 Slip a silicon spatula (or palette knife) under the crepe, then flip it over. Cook the other side for about 30 secs. Slide the cooked crepe out on to a clean tea towel placed on a wire rack. Repeat to cook the rest of the batter, After a while, you won't need to grease the pan every time. Stack the crepes on top of each other as they are cooked and keep them wrapped in the tea towel. If serving shortly, keep the crepes warm in a warming oven until ready to serve. If you are making them well ahead, it's better to wrap them in double layer of cling film or a large food bag to stop them drying out, then reheat in the oven, loosely wrapped in foil, at 180C for 10-15 minutes to serve. 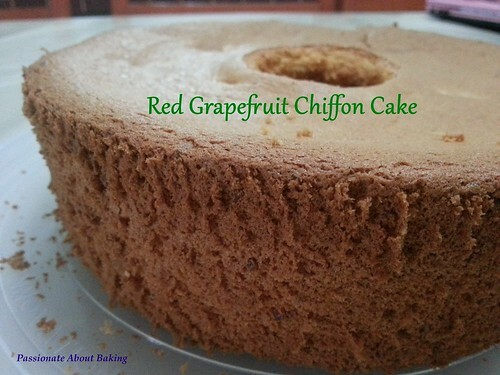 With homemade grapefruit jam on hand, I decided to use it to make a chiffon cake. Since I'm not a "jam" person, I was afraid I might keep it until it spoiled. Referencing from Kevin Chai's book, I modified the recipe a little. 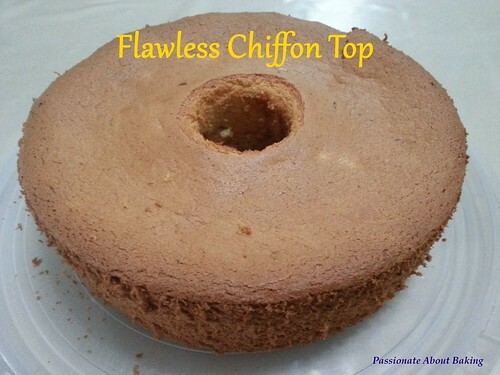 I was very happy the chiffon cake turns out well. 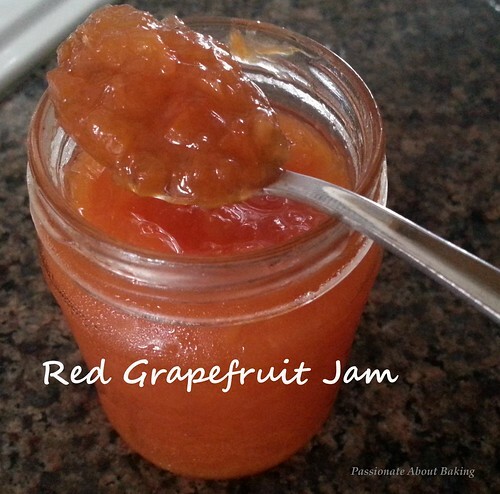 The texture was just right and the taste was really red grapefruit!! 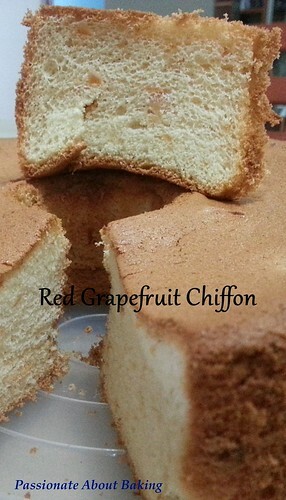 I will probably use up my grapefruit jam making chiffon cakes! 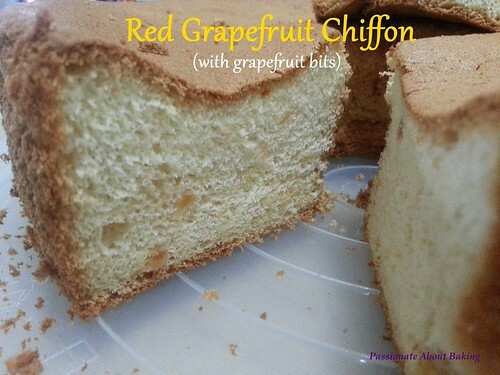 Recipe for Red Grapefruit Chiffon Cake, modified from Kevin Chai's "Chiffon cake is done!" 1. Egg yolk batter: Whisk egg yolks and sugar till light. Add in milk, and jam. Mix well. 2. Add in oil, mix till combined. 3. Fold in sifted flour till combined. Leave aside. 4. Egg white foam: Beat egg whites till foamy. Add cream of tartar to the sugar, mix well. Then gradually add in the sugar to the egg whites. 5. Beat till stiff peak. 6. Gently fold beaten egg white foam into the egg yolk batter till evenly blended. 7. Pour the batter into the prepared tub pan. 8. Bake in a preheated fan oven at 160C for 40 mins or until cooked. 9. Remove from oven and invert cake on a wire rack till completely cooled before removing from the pan. 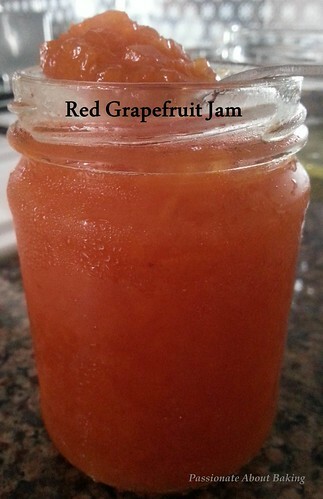 I bought red grapefruits and didn't know what else to do with it. 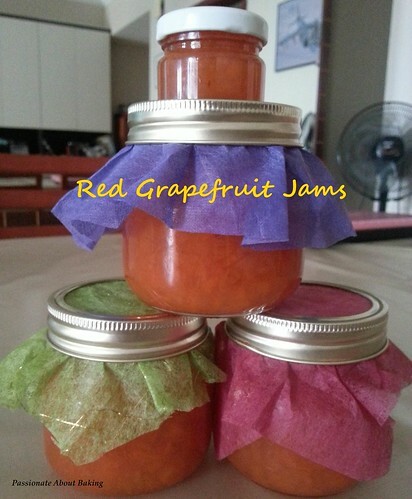 So I decided I shall make grapefruit marmalade as X'mas presents for my family. I referenced this video in Youtube. Based on the video, I translated and modified it into a recipe. 1. In a heatproof bowl, placed the three grapefruit and add hot water into it. Let it steep for about 5 minutes. 2. Drain the water off. 3. 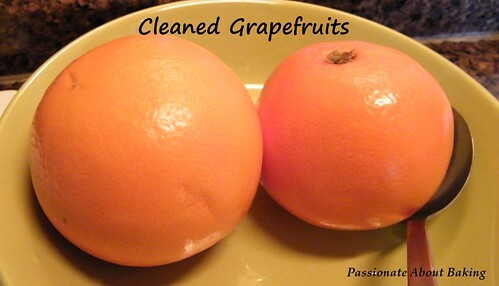 Using a clean cloth or serviette, clean the grapefruit skin well. This is to remove the insecticle from the grapefruit skin. 5. Place in a pot with 2 cups of water. 6. Bring to a boil, then turn off the heat. Let the lemon steep in the water. 7. 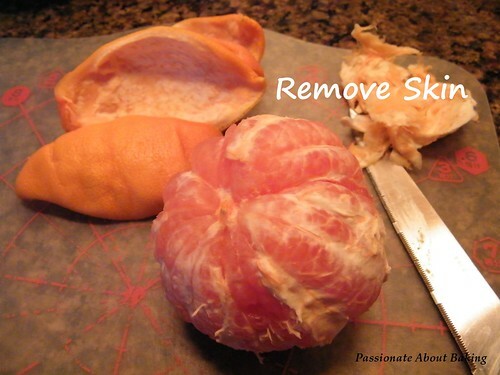 Using a sharp knife, slice the skin of the grapefruit to into quarters and carefully peel off the skin. 9. 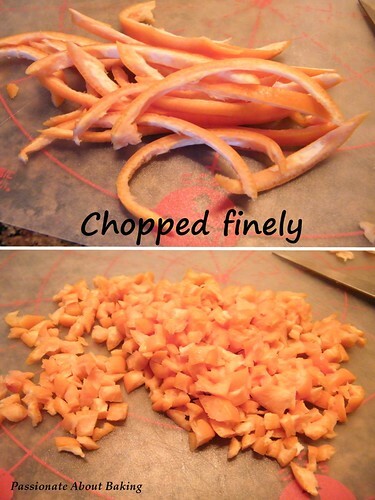 Then cut the skin thinly, then finely. Repeat for the rest of the skin, and the grapefruits. 10. Then cut out the grapefruit flesh. Repeat for the rest of flesh. 11. Carefully put the flesh and the overflowing juices and the skin into a large pot. 12. 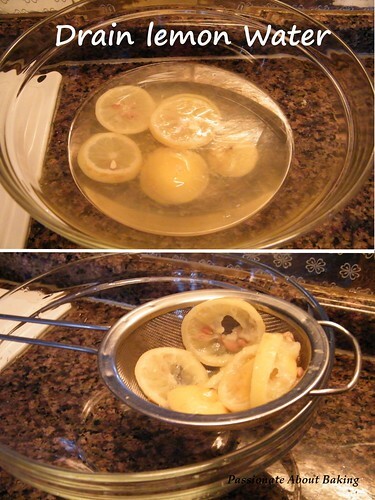 Drain out the lemon slices from the water, and pour into the cut grapefruits. 13. 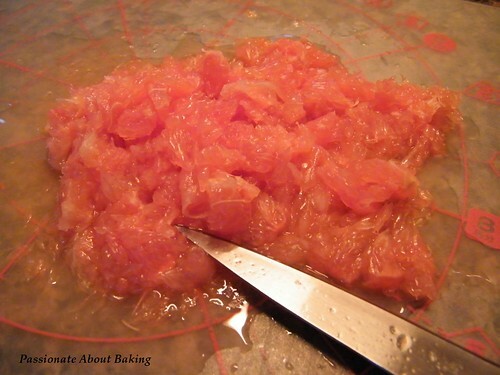 Ensure that there is sufficient water to cover all the grapefruit skin and pulp. 14. 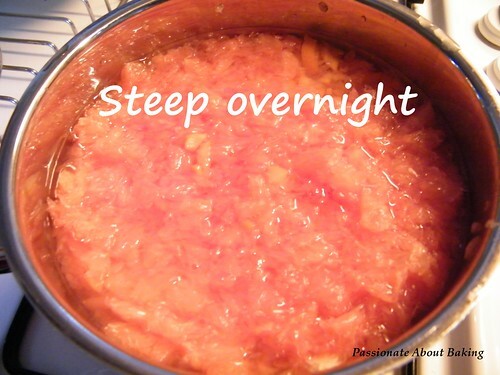 Let it steep overnight in the covered pot. 15. Heat the covered pot in low heat. Slowly let it simmer for an hour. 16. When the grapefruit skin has turned soft (breaks easily), add sugar spoon by spoon. Ensure that each spoon of sugar dissolves before adding another. 17. Let it boil for a few minutes, then turn down the heat again and stir it carefully. Repeat this once and turn off the heat. 18. Scoop them while hot into the prepared clean jar. Immediately close the lid. 19. When it cools, the jar lid will "pop" to indicate that it is air-tight. You can beautify the jar by adding colour wrapper to it, and present it as a gift. I made this as X'mas present and give away. I received very good feedback from my family members that it's not sweet and nice. The amount of sugar added is based on estimation and taste. Initially, I only weight 150g sugar, then I realised it didn't thicken, and it was bitter. So I added another 100g, then another 50g. The sweetness was just right to cover the bitterness of the grapefruit. After boiling, my jam was still a bit watery. Do take note not to add too much water. However, after I refrigerate it, it thickens a bit, but still a little on the watery side. I use it as such. It's important to heat the jar. You can either boil it in a pot, or heat it up in the oven. This is to sanitize the jar. Consume it within a month. Keep it refrigerated in the fridge after opening. 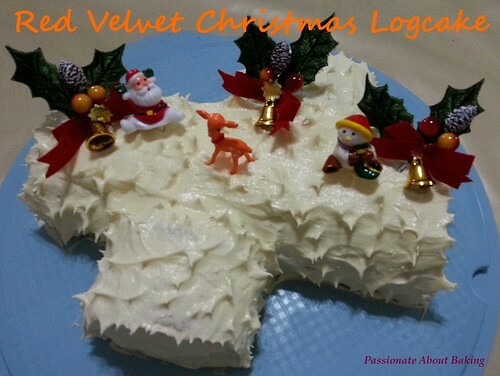 Early November, in the Facebook group of the Singapore Bakers, someone posted a red velvet logcake. 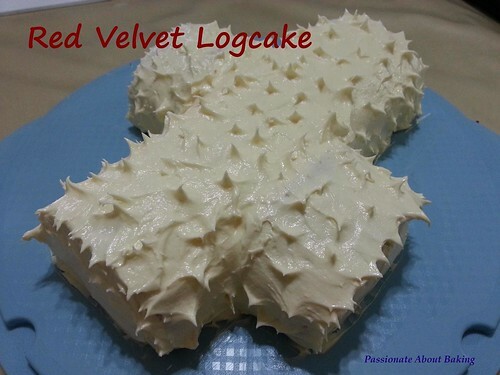 I thought it might be a good idea to make red velvet logcake this year. There were already some famous bakery selling this. I supposed the recipe for red velvet logcake will be different from the normal red velvet cupcake. 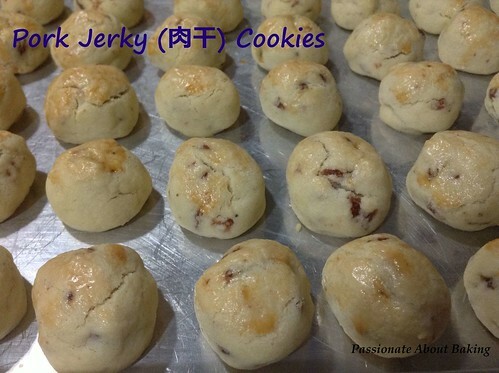 As shared by the member, the recipe was modified from Yummyholic site. The batter from the original recipe was too stiff that it was really difficult to fold. So I added oil and milk to it, to make it more foldable. 1. 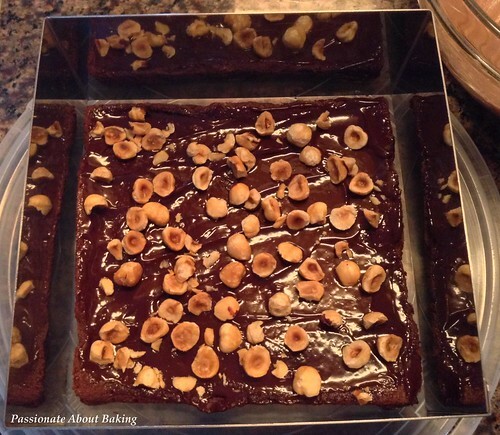 Prepare a cake tray and lined with parchment paper. 2. Sift the cake flour, baking powder, cocoa powder and salt; set aside. 3. Whisk egg yolks and sugar till light and frothy. Add milk and vegetable oil, mix well. Then add colouring. 4. Add in the sifted flour mixture into the batter and mix well. 5. Beat egg whites in a mixing bowl till frothy. 6. Add the cream of tartar into the caster sugar, mix well. Gradually add in the caster sugar into the egg whites. Beat till stiff peak. 7. Fold the egg whites into the egg yolk batter. Mix well. 8. Bake for 12 mins in a preheated oven of 180C or until browned. 1. Beat cream cheese and butter until light and creamy. 2. Add in sifted icing sugar and mix well. 3. Add in lemon juices and combine well. 1. 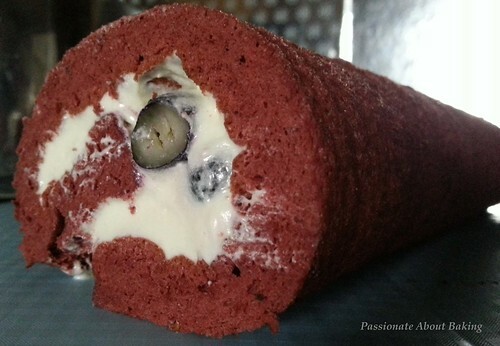 Spread the cream cheese frosting onto the swiss roll, followed by blueberries if using. 2. Roll it up tightly. 3. 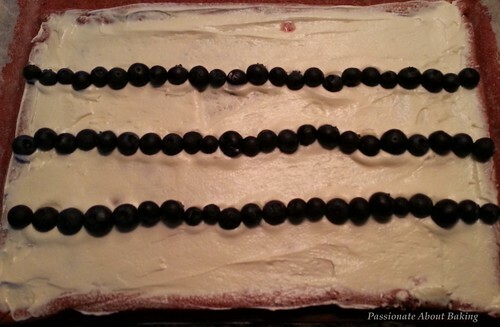 Trim both sides of the cake and placed the swiss roll to the main log. 4. Frost the whole cake with cream cheese. 5. To make the spikes, just use the spatula to gently pat on the cream cheese frosting and lift it up quickly. Repeat the process for the whole cake. 6. 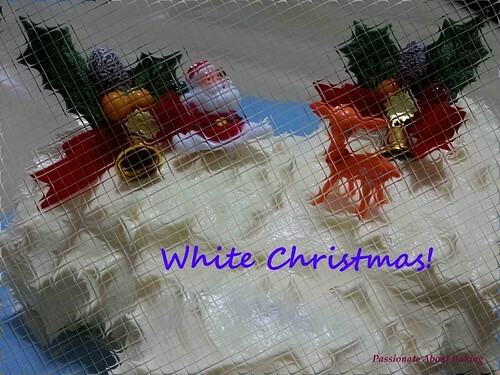 Decorate with X'mas cake ornaments as desired, then chill it in the fridge before serving.